Promotes peak body conditions. Low fat & carbs. BIOLOGICALLY APPROPRIATE™ | FOR CATS FRESH FREE-RUN CHICKEN AND TURKEY, NEST-LAID EGGS & WILD-CAUGHT FISH TO PROMOTE PEAK BODY CONDITIONING, CATS NEED A PROTEIN-RICH DIET WITH MODERATE FAT AND LIMITED CARBOHYDRATES.Surrounded by Atlantic, pacific and arctic oceans, and blessed with vast unpolluted rivers and lakes, Canada boasts a marine harvest perfectly suited to ORIJEN's philosophy of Biologically Appropriate cat foods from fresh ingredients. 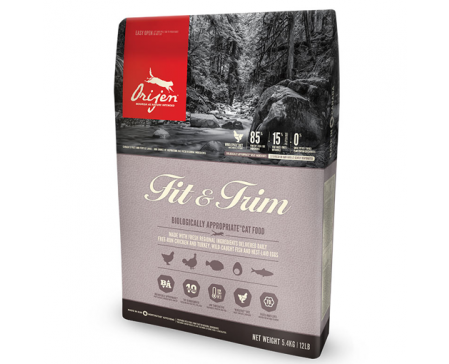 Loaded with protein-packed fish (80%) to support lean muscle mass, ORIJEN's low-carbohydrate, low-glycemic formula supports healthy blood sugar levels for peak health and optimum body weight in cats of all breeds and life-stages. Prepared from Canada's freshest fish, fruits and berries, in Champion Petfoods' very own kitchens, award-winning ORIJEN keeps your cat or kitten happy, healthy and strong.With 44% richly nourishing protein, 15% low-glycemic carbohydrates, and a unique blend of fibres to nourish cats according to their evolutionary and biological needs.Unmatched by any other food, 2/3 of the meats are FRESH (refrigerated, without preservatives) or RAW (flash-frozen, without preservatives), including the top 10 meat ingredients.1/3 of the meats are prepared at 90°C from fresh chicken, turkey and fish to create a concentrated source of richly nourishing protein that cannot be supplied by fresh meats alone.Nutrient-dense WholePrey™ ratios of fresh meats, organs, and cartilage plus fresh whole fish and fresh whole eggs provide a natural source of virtually every nutrient your cat needs.Infusions of gently freeze-dried liver enhance flavour and palatability naturally, making ORIJEN deliciously tasty, even for selective eaters.ALTHOUGH THEY MAY LOOK VERY DIFFERENT, YOUR CAT SHARES HER DNA AND EATING ANATOMY WITH THE LION, WHICH MEANS SHE’S ADAPTED FOR A DIET RICH IN MEAT - NOT CARBOHYDRATES AND GRAINS.RICH IN MEAT (85%) AND PROTEIN (44%) All cats are adapted for a diet rich in meat and protein. Their sharp teeth and body mechanics are designed to metabolize protein and fat from meat. 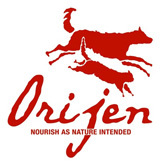 ORIJEN is created to nourish your cat or kitten according to her biological needs.• 85% meat ingredients (2/3 FRESH or RAW and 1/3 gently dehydrated) • 15% low-glycemic vegetables and fruits • 44% richly nourishing meat protein • 100% of meat ingredients from animals deemed fit for human consumption, prior to inclusion in our foods • NO plant proteins extracts or concentrates (potato or pea protein) • NO high-glycemic carbohydrates (tapioca, potato, rice) • NO glutens or grainsUNMATCHED FRESH MEAT INCLUSIONS (2/3) Fresh meats are the foundation of award-winning ORIJEN foods.• 2/3 of the meats are FRESH or RAW, supplying your cat with essential nutrients in their most natural and nourishing form. • 1/3 of meats are dehydrated at low temperature for a concentrated source of nourishing protein that cannot be supplied by fresh meats alone.AN ABUNDANT VARIETY OF MEATS (7) In nature, cats benefit from an assortment of meats. 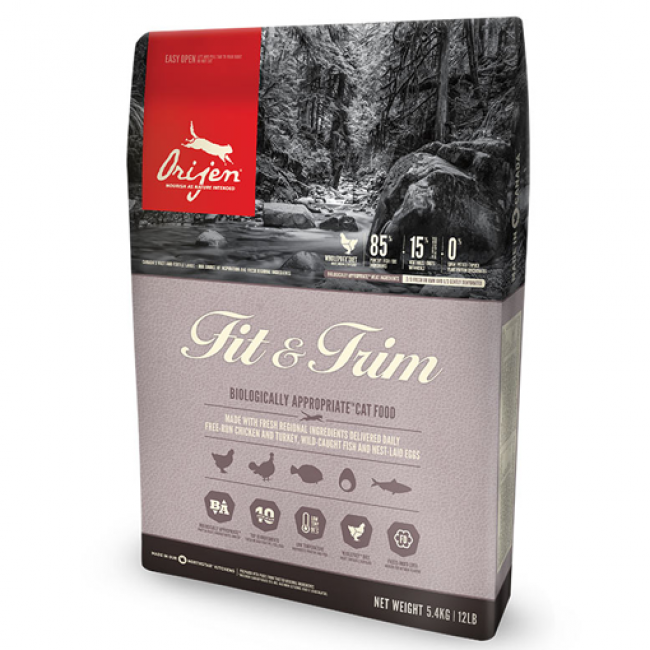 This variety is often lost in conventional cat foods which typically feature a single animal ingredient such as chicken or lamb that is highly processed and seldom fresh.That’s why award-winning ORIJEN Fit & Trim features a rich diversity of fresh meats in Biologically Appropriate™ WholePrey™ ratios to nourish for peak health:• Fresh free-run Cobb chicken from Prairie farms • Fresh free-run turkey from Prairie farms • Fresh and whole nest-laid eggs from Prairie farms • Fresh, whole Pacific Herring, Mackerel, Flounder and Hake, wild-caught from North Vancouver IslandWHOLEPREY™ MEAT RATIOS WholePrey™ represents the evolution of ORIJEN foods, incorporating fresh meats, organ meats and cartilage in ratios that mirror nature and eliminate the need for long lists of synthetic supplements.• Meat – essential for protein and fat as well as Vitamins A, B, D and K, copper, chromium, folic acid, iron, magnesium, potassium, selenium and zinc. • Organs – packed with virtually every nutrient your cat needs to thrive including vitamins, minerals, healthy fats and amino acids. • Edible Bone – a rich source of minerals including calcium, phosphorus, magnesium and potassium in natural form your cat’s body can easily absorb.CARBOHYDRATE-LIMITED (15%) Cats are obligate carnivores and have no biological requirement for carbohydrates yet conventional cat foods still contain large amounts of high-glycemic carbohydrates such as potato and tapioca, which are often cited as a leading cause of obesity and diabetes.Biologically Appropriate™ ORIJEN Fit & Trim is a protein-rich and carbohydrate-limited food featuring lentils, chickpeas, squash, greens and fruits which release sugar slowly, dramatically reducing the potential for fat storage.